Sweeteners (maltitol, sucralose), palm oil, whey protein isolate [milk], maize flour, coconut pieces (9.5%), starch, almonds, milk powder, bulking agent (polydextrose), cocoa butter, fat-reduced cocoa powder, coconut milk powder (1.2%), almond paste, emulsifier (soy lecithin), salt, maltodextrin, thickener (guar gum), raising agent (ammonium carbonate), antioxidant (ascorbic acid), flavourings. 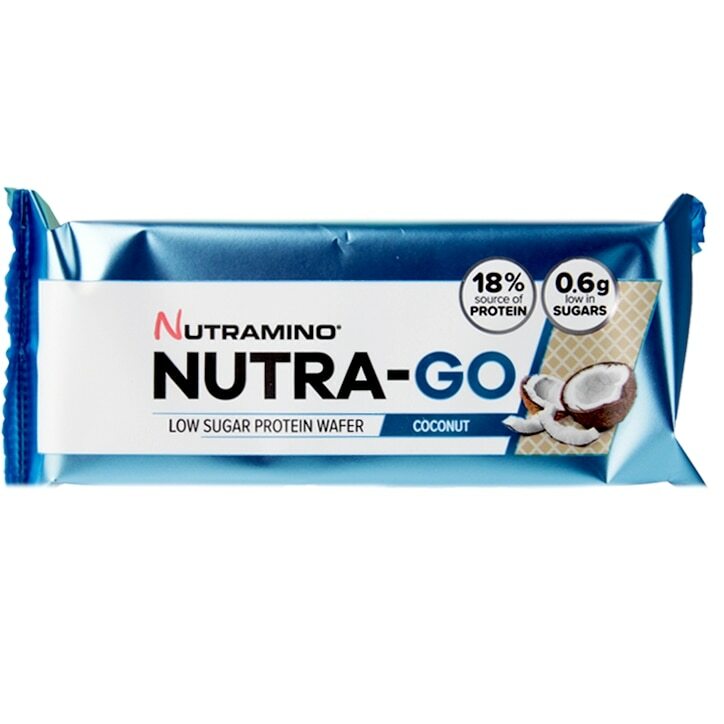 Nutramino Nutra-Go Protein Wafer Coconut is rated 5.0 out of 5 by 7. Rated 5 out of 5 by Shaz770 from Great for women if you hate protein bars! I was pleasantly surprised by the taste of this protein bar. It reminds me of my Christmas lfhood when my mum gave me pink panther wafer biscuits. I absolutely hate protein bars because, for me, they are not tasty and i don’t feel satisfied with the sweet content. My partner eats them and tries to encourage me but he doesn’t get far! This bar however has got me excited about protein bars because they taste great. It feels like im eating a normal tasty wafer biscuit. You have to try it! Rated 5 out of 5 by Zane112 from Absolutely amazing My absolutely new favourite! Great taste, less sugar and tastes amazing with coffee. No more cakes for me, this will be new favourite snack. It really fills you up. And packaging also is amazing, if you don’t want it all, you can save some for later.